How Do You Measure The Productivity Of Unpredictable Work? How do you measure productivity when the scope or type of work changes all the time? Widgets per hour isn’t the answer. Imagine there’s a team in a diagnostics company, and they perform a range of clinical tests for their clients. The tests might be infectious diseases or allergies, for example. The nature of the work changes all the time. They don’t know what tests customers are going to order. They don’t know how long or complex each test will be. But they’re interested in measuring their productivity. It’s not as simple though, to count the number of tests completed per day. Some days it will be high, when more of the tests are simple. Other days it will be low, when more of the tests are complex. We have to reframe what we mean by productive. Productive is a weasel word. It means different things to people, and of course it means different things in different contexts or situations. We need to de-weasel it. In it’s theoretical definition, productivity is the amount of output relative to the amount of input to produce that output. And we’ll need to explore what the output and input is for our situation. For the clinical tests team, the output is a test report. The most obvious input is the team’s time. Because the team’s outputs (tests) correctly require various amounts of input (their time) because of their varying complexity, the classic productivity definition doesn’t work. We don’t know how much of the variability in the measure is due to wasted time or necessary time. Wasted time is the clue. What if we explored the opposite of productive? What a performance result means to us, in our unique situation, must be clear before we try to measure it. There is no meaningful performance measure without there first being a meaningful performance result. So the team could instead measure “unproductivity”. So instead of trying to measure the amount of productive time, they could measure the amount of wasted time each week. They could set up a simple way to capture – perhaps even in their diaries – the hours of their own time that was wasted. This could focus them on redesigning or tweaking their testing processes to find ways to reduce it. But only if the intention stays clean – and we don’t let even a skerrick of blame or judgment creep in. The temptation will be to measure productivity of individuals in the team as well. Don’t give in to that temptation! What do you think it’s going to encourage? Competition, perhaps. Defensiveness, almost certainly. Anxiety, quite likely. If we want to improve something, we instead need collaboration, honesty, and engagement. Any measure of a team should be a measure owned by the team. Not by the managers. It should be a tool in their hand, to help them improve the process they work in. It should never be a rod for their backs, to help managers “performance manage” people. What managers should be interested in is how the team’s improved productivity influences higher-order goals that the manager owns. Higher-order goals like on-time delivery to customers, customer satisfaction, and profitability. It helps to draw a map, so it’s easier to put attention on what we really want, which is improving the system as a whole. 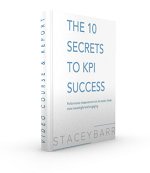 There is no meaningful KPI without there first being a meaningful goal. Do you have a classic goal or result like productivity, that you’ve found just doesn’t fit your situation, but you still want to measure it meaningfully? Thank you for looking out for the potential unintended consequences of measuring productivity by person. There is one more caution I would surface. As a fan of constraint management, we need to be careful with productivity measures because the assumption is always that the person can be busy 100% of the time and if they can be that it is worth it to have them busy. In other words, your workers are producing above market demand, you are potentially created WIP which extends lead time, consuming your constraint with non-critical items, or burning cash in creating finished goods inventory. These outcomes require deliberate management decisions as they can be fatal to a business if done unintentionally for long periods of time. If anyone has not read Goldratt’s The Goal, I highly recommend it or look at Wikipedia for Theory of Constraints. We still measure to see how the process is doing or as Stacey puts it in Prove It! ; Measures as a tool for the hand, not a rod for the back. I love Goldratt’s book, Tom. 1) We never, ever measure individual people. 2) We never, ever use a measure in isolation. Note that there are errors that are deliberately made but not all of them would be easier to measure. How often do people deliberately make errors? Is there any objective evidence you can observe or detect to know whether an error is deliberately made or not? What evidence can you observe or detect about the errors people make? Are there certain categories of errors that people tend to make deliberately, and categories of errors that are rarely made deliberately? What if you just focused on all errors, and let cause analysis help you reduce the errors you have the most influence over? Aim for a series of improvements over time, irrespective of whether the error is deliberate or not?